It is nearly impossible to run a business today without being exposed to risk and liability. While the nature of risk can greatly vary based on industry, many companies can trace the origin of liability claim issues back to inadequate or outdated policies and procedures. 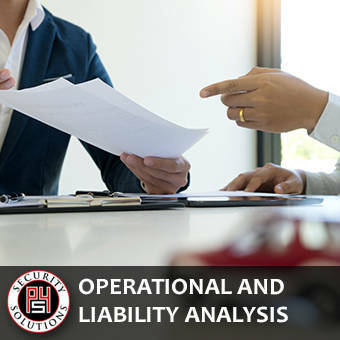 The highly experienced professionals at P4 Security Solutions have helped many organizations of all sizes and types in evaluating their fundamental operating procedures, with the goal of proactively detecting any areas that could possibly lead to liability claims. Hiring practices in accordance with applicable law. Employee handbook and other related manuals. Required updates, training and enforcement of policies. Supervisory selection process, specific to duties/responsibility. Training of supervisors with regard to HR best practices & law. Coaching of supervisors to achieve best business outcomes. Quality of training with regard to defined objectives. Frequency & consistency of training sessions. Measurement of training results & follow up. Assessment of equipment & systems in light of specific business need. Compliance with safety regulations & other mandated policies. Studies have shown that organizations that focus on the quality of and adherence to company policies and procedures have far fewer liability claims in all areas. Through our operational analysis process, the skilled and highly trained professionals at P4 Security Solutions can help your organization create and maintain corporate procedures that create a positive, productive and profitable work culture for both employers and staff members.